Easy Piercing Seal (EPS) punctures easily to prevent needle clogging or damage. In addition, no adhesive residues are left on the plate or injector needle. The EPS plate seal is made of polyolefin and is highly resistant to organic solvents. Some suggested applications are HPLC and LC/MS. 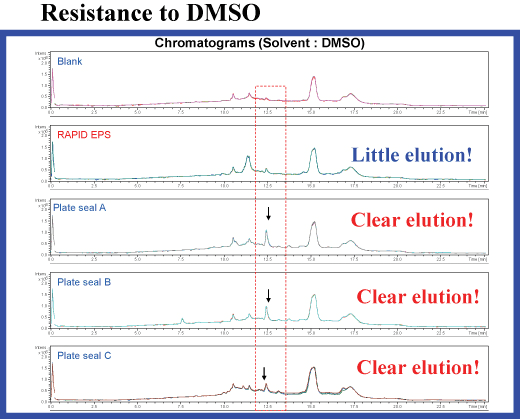 High resistance to organic solvents such as DMSO, Acetonitrile, and Methanol. 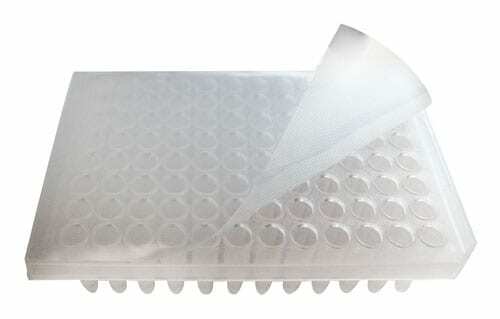 Embossed design pierces easily to prevent needle clogging or damage. Works with 96, 384, and 1536 well plates. Airtight sealing between -80°C and 80°C. Adhesive does not remain on the plate after peeling off. HPLC users who have experienced needle blockage and adhesive residue on the needle surface of the autosampler. LC/MS users who have experienced background peaks during high sensitivity analysis due to degradation and elution of adhesive. Researchers who seek easily pierced seals with needles or syringes. Minoni, L. (2018). β3 human papillomavirus species share several biological properties with high risk mucosal types (Doctoral dissertation). Koppel, N., Bisanz, J. E., Pandelia, M. E., Turnbaugh, P. J., & Balskus, E. P. (2018). Discovery and characterization of a prevalent human gut bacterial enzyme sufficient for the inactivation of a family of plant toxins. eLife, 7, e33953. Kuwayama, K., Miyaguchi, H., Iwata, Y. T., Kanamori, T., Tsujikawa, K., Yamamuro, T., … & Inoue, H. (2017). Different localizations of drugs simultaneously administered in a strand of hair by micro‐segmental analysis. Drug Testing and Analysis. Anderson, K. B., Lockwood, S. Y., Martin, R. S., & Spence, D. M. (2013). A 3D printed fluidic device that enables integrated features. Analytical chemistry, 85(12), 5622-5626.